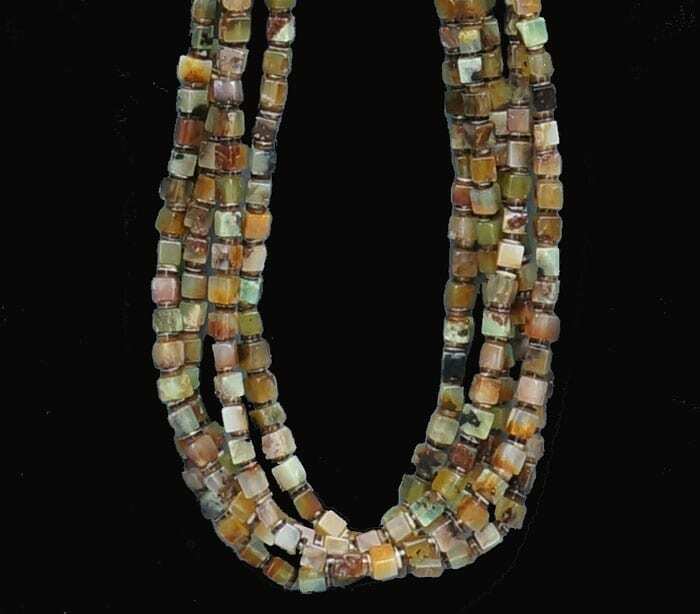 This necklace is strung with hand cut and shaped cubic Russian agate beads which glimmer and show many hues from green to brown to ochre. The necklace is topped with Mediterranean coral tube beads, also hand cut and shaped. The necklace is strung with very strong thread that allows for use of easy knots such as the bow (or shoelace knot) or other simple knots that can be untied with one pull, yet hold securely because of the sturdy braided thread. Beaded section is 16 in. in length; braided thread allows for customizing the length of the necklace with a range of several inches by varying the location of the knot. 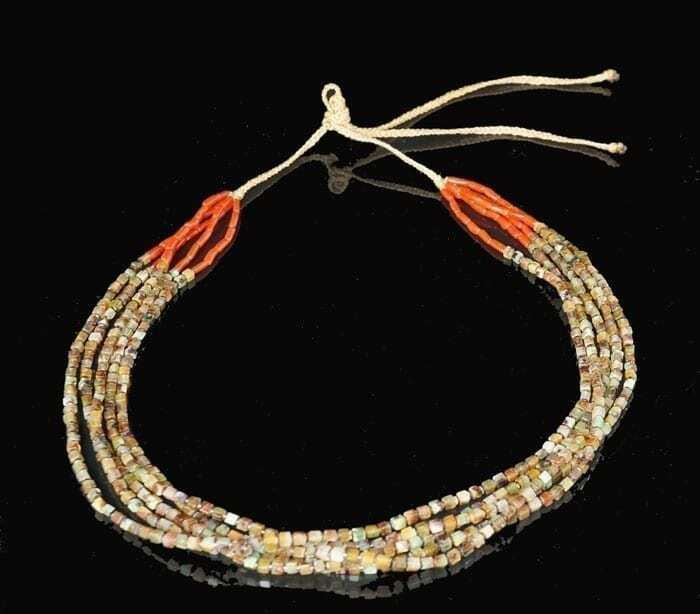 This necklace is strung with hand cut and shaped cubic Russian agate beads which glimmer and show many shades from green to brown to ochre. The necklace is topped with Mediterranean coral tube beads, also hand cut and shaped. The necklace is strung with very strong thread that allows for use of easy knots such as the bow (or shoelace knot) or other simple knots that can be untied with one pull, yet hold securely because of the sturdy braided thread. Priscilla Nieto and Harvey Abeyta grew up and live in the community of Santo Domingo. 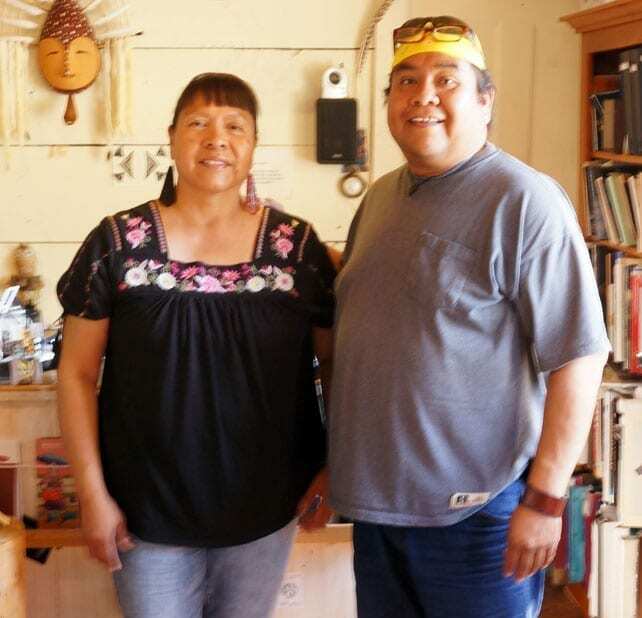 Both of them create beaded necklaces and other jewelry from hand-cut stones and shell. Their five children also help in the family business, making for a very hard-working and creative family. Priscilla learned at her parents’ side, and she remembers the techniques that were used before power tools and other tools were available, including hand sanding of beads on sandstone and using hand powered drills. Steeped in this tradition, the family makes traditional necklaces using materials that were not available to the community in the past, including such uncommon stones as green Russian agate. In addition to the use of high grade materials and impeccable workmanship, the family has developed a favorite material for stringing their beads; they use of carpet threading, which is extremely durable as well as comfortable to wear. Many of their necklaces are untied, leaving the customer the option of creating their own length. The carpet threading, which they braid, makes strong knots that do not unravel while being worn. Mary Tafoya creates innovative designs in mosaic which sets her apart from most other Santo Domingo pueblo artists. In addition to design quality, the use of jet in her adhesive creates a wonderful contrast of black with other materials. Materials Tafoya uses include various types of shell, black jade, serpentine, jasper, alabaster. The pendant is backed with serpentine, a signature Tafoya feature. 2 1/2" high, including bail; 1 3/8" wide; 1/4" thick. Sterling silver bail. These earrings are made from cuttlefish cast sterling silver. They are extremely elegant, with a small, natural Sleeping Beauty turquoise cabochon. These are post earrings. Mary Tafoya creates innovative designs in mosaic which sets her apart from most other Santo Domingo pueblo artists. In addition to design quality, the use of jet in her adhesive creates a wonderful contrast of black with materials. of many colors. This necklace pays tribute to the traditional Santo Domingo form of the Thunderbird. During the Great Depression preceding World War II, Santo Domingo artists continued to make jewelry using this form, but substituting plastic from car batteries, vinyl records, and household implements for more expensive stone and shell that were unaffordable at the time. 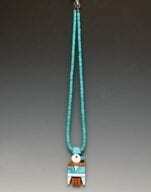 This necklace contains turquoise, alabaster, spiny oyster shell, and jet; it has Tafoya's signature serpentine backing. 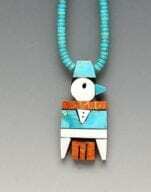 Turquoise beads and a sterling silver clasp complete the necklace. Necklace is 17 3/4"; bird is 2 1/8" high x 1" w x 1/4" thick.